HENDRICKS, Thomas Andrews, (nephew of William Hendricks), a Representative and a Senator from Indiana and a Vice President of the United States; born near Zanesville, Ohio, September 7, 1819; moved with his parents to Indiana in 1820; pursued classical studies and graduated from Hanover (Ind.) 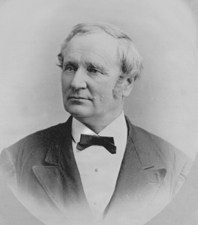 College in 1841; studied law in Chambersburg, Pa.; admitted to the bar in 1843 and commenced practice in Shelbyville, Ind. ; member, State house of representatives 1848; member of the State constitutional convention; elected as a Democrat to the Thirty-second and Thirty-third Congresses (March 4, 1851-March 3, 1855); unsuccessful candidate for reelection in 1854 to the Thirty-fourth Congress; chairman, Committee on Mileage (Thirty-second Congress), Committee on Invalid Pensions (Thirty-third Congress); Commissioner of the General Land Office 1855-1859; unsuccessful Democratic candidate for Governor of Indiana in 1860; moved to Indianapolis in 1860 and practiced law; elected as a Democrat to the United States Senate and served from March 4, 1863, to March 3, 1869; Governor of Indiana 1872; unsuccessful candidate for Vice President of the United States on the Democratic ticket with Samuel Tilden in 1876; elected Vice President of the United States in 1884 on the Democratic ticket with Grover Cleveland and served from March 4, 1885, until his death in Indianapolis, Ind., November 25, 1885; interment in Crown Hill Cemetery. American National Biography; Dictionary of American Biography; Gray, Ralph D. Thomas A. Hendricks: Spokesman for the Democracy. In Gentlemen from Indiana: National Party Candidates, 1836-1940, edited by Ralph D. Gray, pp. 117-39. Indianapolis: Indiana Historical Bureau, 1977; U.S. Congress. Memorial Addresses. 49th Cong., 1st sess., 1886. Washington, D.C.: Government Printing Office, 1886.